Using the paint, have the child/children make handprints on white cardstock. When the paint is dry, cut around the handprints in a circle to use as the center of the flower. 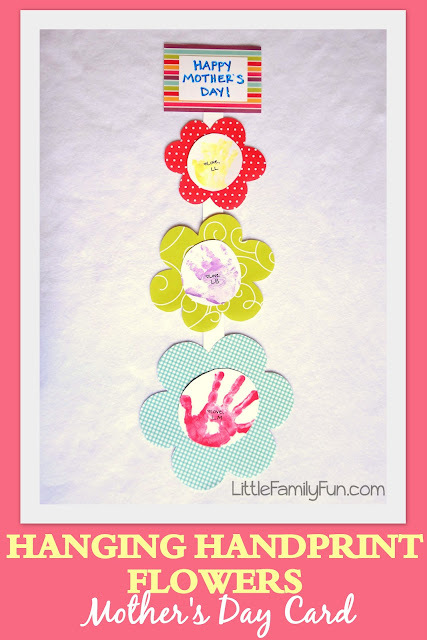 Using a piece of scrapbook paper, draw simple flower shapes around the handprint centers and cut them out, and glue the handprints on. Write the names of the children on their handprints, and a message if you want. Cut out strips of white cardstock and glue them together to make one long strip. Glue the flowers onto it. Add a piece of paper to the top with white cardstock on it and write "Happy Mother's Day!"